Denebola is located about 36.2 light-years (ly) from Sol. It lies in the east central part of (11:49:3.6+14:34:19.4, ICRS 2000.0) of Constellation Leo, the Lion -- east of Regulus (Alpha Leonis), and north of Zavijava (Beta Virginis), and southeast of Alula Australis (Xi Ursae Majoris) and Alula Borealis (Nu Ursae Majoris). Named in many ancient cultures, the star is commonly called "Denebola" in modern star catalogues, originally from "Al Dhanab al Asad," the Lion's Tail of the constellation, but sometimes shares the name of the well-known supergiant "Deneb" (Richard Hinckley Allen, 1889: page 258). Like Vega, it has a circumstellar dust or "debris" disk (more below). The presence of stellar or major substellar companions has not been definitively ruled out (more below). 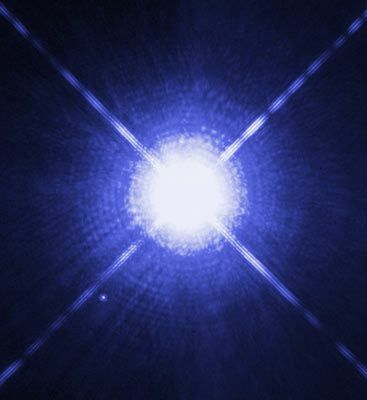 Star A is bluish white main sequence dwarf of spectral and luminosity type A3 Va (NASA Stars and Exoplanet Database; Gray et al, 2003; and Garrison and Beattie, 1998). Based on an interpolation table, the star's has around 2.10 of Sol's mass (NASA Stars and Exoplanet Database; and David F. Gray, 1992), 1.58 times its diameter (Akeson et al, 2009), and around 11.5 times its visual luminosity and 13.4 times its theoretical bolometric luminosity (Akeson et al, 2009; NASA Stars and Exoplanet database; and Kenneth R. Lang, 1980). The star may be up to 200 million years old (Di Folco et al, 2004). Denebola has been classed as a Delta Scuti-type variable star (which vary in brightness by small amounts over periods lasting only hours and including radial as well as non-radial pulsations) as it exhibits small, Delta Sculti-type variability with around a 2.09 to 2.16 visual magnitude difference -- in V on UBV Johnson system (Mkrtichian and Yurkov, 1998). Useful catalogue numbers and designations for the star include: Bet Leo, 94 Leo, HR 4534, Gl 448, Hip 57632, HD 102647, BD+15 2383, SAO 99809, FK5 444, LHS 2462, LTT 13249, LFT 853, ADS 8314 A, and WDS 11492+1434 A. An Earth-type planet could have liquid water in a stable orbit centered around 3.5 AU (within a predicted habitable zone ranging between 2.3 and 4.8 AUs) from Star A -- between the orbital distances of the Main Asteroid Belt and Jupiter in the Solar System (NASA Stars and Exoplanet Database). Such a planet would have an orbital period around 4.6 years. If there is life on any Earth-type planet orbiting youthful Denebola, it is likely to be primitive single-cell, anaerobic (non-oxygen producing) bacteria under constant bombardment by meteorites and comets as Earth was for the first billion years. Since there is unlikely to be free oxygen in the atmosphere of such a planet, it probably would not have an ozone layer (O3) as Denebola puts out a lot more hard radiation in ultraviolet wavelengths than Sol. Such a planet would, however, be difficult to detect using present astronomical methods and equipment. Although very young stars tend to have circumstellar dust or "debris" disks, such dust grains generally disappear quickly during the formation of the star. Despite their relatively youth, many A-type stars are already old enough that most of the dust found around these relatively short-lived are not a remnant of the star formation process but are instead generated through collisions of larger proto-planetary bodies. If located within a few AUs of the central star, this dust is warmed to temperatures that produce near-infrared emission and small grains produce scattered light. According to Akeson et al (2009), Denebola was first identified as having an circumstellar dust or "debris" disk from an excess of infrared radiation observed with the Infrared Astronomical Satellite (IRAS) in 1983 (Aumann and Probst, 1991, see G448.0, GL 448, or BS 4534). The disk could not be resolved with mid-infrared imaging (Jayawardhana et al, 2001) but Chen et al (2006, see HR 4534) obtained used the Spitzer Infrared Space Telescope to find a featureless continuum spectra consistent with dust at around 120 Kelvins (K) located 19 AUs from the star. Infrared interferometric observations of Denebola's debris disk were used by Akeson et al (2009) to model two possible bands of dust beginning around 0.13 AU (and extending for 0.3 AUs) and around 13 AUs (extending for 6.2 AUs). The Washington Double Star (WDS) catalog lists three distant, possibly optical companions for Denebola (WDS 11492+1434 B, C, and D), located from 40 to 240 arcseconds from the primary with V magnitude differences of 6.3 to 13 (Worley and Douglass, 1997; S.W. Burnham, 1878; and G. Knott, 1864). On the other, the Hipparcos Space Astrometry Mission (1989-93) failed to detect significant astrometic motion resulting from a major close companion as small as 0.5 Solar-mass between 11 AUs (one arcsecond) and 0.35 AU of the star (Akeson et al, 2009). Further analysis by Akeson et al (2009) on a puzzling reduction in mid-range infrared excess "visibility" failed to rule out the possibility of an unseen stellar companion (as bright as M0 red dwarf) in a wide orbit with a period measured in years or a very close orbit companion with a period measured in as short as a few days. The following table includes all star systems known to be located within 10 light-years (ly), plus more bright stars within 10 to 20 ly, of Denebola. Try Professor Jim Kaler's Stars site for other information about the Denebola at the University of Illinois' Department of Astronomy. Up-to-date technical summaries on this stars can be found at: the Astronomiches Rechen-Institut at Heidelberg's ARCNS, and SIMBAD; and the NASA Stars and Exoplanet Database. Additional information may be available at Roger Wilcox's Internet Stellar Database, and from www.alcyone.de for Denebola. New research papers may eventually become availableat the SAO/NASA ADS. Constellation Leo represents the Lion that Hercules (also a constellation) had to kill as one of his 12 tasks. For more information and an illustration of the constellation, go to Christine Kronberg's Leo. For another illustration, see David Haworth's Leo.